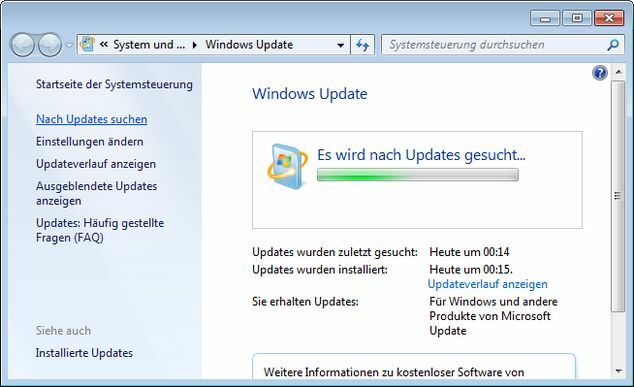 [German]Last night, I was hit during Microsoft May patch day (05/190/2016) with an extraordinary long update search under Windows 7 SP 1. It seems that Microsoft has changed something in Windows update client and that security update KB3153199 should fix again a “slow Windows 7 SP1 update search”. Here, on my Windows 7 SP 1 productive system it took about an hour to find some updates (whilst a Windows 8.1 machine was able to detect updates within 10 minutes). I mentioned it in my German blog post Patchday: Microsoft Updates vom 10. Mai 2016 (written this night). Booting my Windows 7 SP1 system this morning I was notified “all updates from 05/10.2016 are successfully installed”. Also a new update search finished within a minute and found another update for Microsoft Security Essentials. While KB3153199 only updates the win32k.sys file (and does not supersede KB3145739 but DOES supersede KB3139852), I will manually download & install the KB3153199 security fix on my Win7 machines to resolve the very long WU scan problem. The hint to download security patch KB3153199 and install it manually should speed up Windows 7 SP 1 update search. I found also a second hint on this German site wu.krelay.de (dealing with “speeding up W7 update search), mention the new security patch KB3153199 as another recommended update to speed up Windows update search. Within the comment section here, another user speculates, that too much traffic slows down Microsoft Update servers. But I can’t believe that, because my Windows 8.1 machine was able to find Windows updates much faster. Anyway, if you are facing a slow Windows 7 SP1 update search within the next few days, maybe the hints given above will be helpful. This entry was posted in Update, Windows and tagged trouble; KB3153199, Update slow, Windows 7. Bookmark the permalink. See my reply on askwoody.com and other posts on that site. Installing ALL Windows Updates including recommended (Optional can be skipped, however they can be installed too for consistency) would resolve the slow update issue. It is by design and I discussed it many times in the last few weeks, based on information posted previously by Susan Bradley and also by Woody Leonhard since Windows XP. In the technical sense, the slow Windows Update scanning is due to a large number of superseded updates on Microsot’s servers and unless installing all updates close to or ideally at the top of the update tree, you will always experience slow Windows Update. I’ve addressed this behavior, you decribed, within a German blog post (I’ve had no time to release an English article yet). But – this doesn’t explain some things. it worked like a charm! really appreciate your tip! During the manual installation of KB3153199 specifically and the long delay while it searches for updates, I found I could cancel the search, shut down the machine and start the KB3153199 installation manually a second time. On the 2nd attempt (after the canceled 1st and full reboot), it wasted no time searching for updates and immediately installed. After manual installation of KB3153199, I have noticed a general speedup in the Windows Update process on a few machines. Thx for adding your findings. I need to add also side note to the above blog post: Installing KB3153199 should be done with internet connection disabled. And the Update client should be reset before you install the update. This avoids the long search for updates during “offline” install of KB3153199 (pretty nasty that offline MS update paket). A reader of my German blog article has already noticed that. Manually installing KB3153199 solved the long Windows Update scan and download problem.